Trajectories » Keeping my spirits up while we wait for baby. Keeping my spirits up while we wait for baby. So, I have a lot of time on my hands these days–hands that will soon be holding our beautiful baby boy or girl and may forget about the existence of time for awhile. But for now, I wait. I read all about “natural childbirth,” how to have the happiest baby on the block, how not to irrevocably screw up this kid even though I know it’s inevitable… And I read a lot of blogs. I have my favorites, one of which I found because my friend Lauren pointed me to an amazing weekly photo series by a guy named Ryan that shows his beautiful wife through her 40 weeks of pregnancy. Ryan is a wonderful writer, so I have continued to read his blog even now that his daughter has come into the world and there are no more cute belly photos. 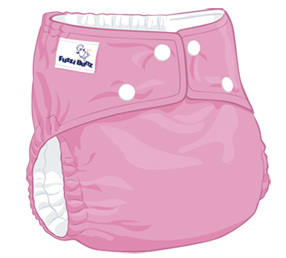 This week Ryan is hosting a give-away for a supply of cloth diapers from FuzziBunz to a deserving set of new parents (hey! we’re pretty deserving, right??). Chris and I had already decided months ago that we want to use cloth diapers but knew that it might take us months to build up a supply because of the higher initial costs of buying cloth. So I just about jumped out of my seat–if I could actually manage such a miraculous feat at my current stage of hugeness–when I saw that he was offering a whole set. FuzziBunz seems like a great brand, so I have no problem plugging their product into my blog on the off-chance that we get an entire supply for free. I would like to point out that I have never won anything in my life. OK, I take that back. I once won a box of doughnuts at a church function when I was 16, but I don’t know how much that counts, considering there are only so many doughnuts one person can eat in a sitting. Winning one doughnut would have been just as thrilling as the whole box. So wish us luck! It would be great fun to win something a little more useful than an extra two pounds on my rear end. I love the website of which you speak. I want the guys lens :O) What a cute mama – how fun to have a husband who takes photos of you. I do not have that. But Dustin has other endearing qualities that should make up for that. You, on the other hand, have a husband who will document everything digital you ever do :O) Good luck with the cloth diapers!